In the negative Centaury state, service, devotion to a cause, and a genuine desire to help turn the person into a doormat - unable to say "No" to any request. 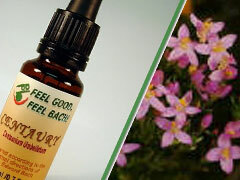 Energy from the Bach Flower Essence Centaury will help restore contact with the powers of one's own will. Those who fall under the spell of "enlightened" teachers are especially at risk of losing their own personalities and weakening their own chances of personal development. Another time when Bach Flower Remedies are indicated is after a prolonged illness, when the person has been unable to do anything for himself. At this time, Centaury will give new vitality to mind and body and allow the person to "return to living."